Crested Butte, CO area opts? We are going to Crested Butte and Gunnison, CO in Sept . I've never been and would like some suggestions on photo opts for landscapes, etc. I sure don't mind short hikes but am not up to long ones. Any suggestions on specific locations and directions ? Many thanks! Kebler Pass is the obvious one, plenty of opportunities for aspen shots. Check out this guy's gallery. Definitely check out Kebler Pass! I just went through that area about 2 weeks ago and thought it was a nice area. Also check out the Black Canyon of the Gunnisons to the west of Gunnison. With a bit of luck I am hoping to get back to Crested Butte early July for the wildflowers! - Dark Canyon Trail (near Horse Ranch Park). Easy hike, great views and an amazing overlook about 1.5 miles in. - The Dyke- either the trail, or the main overlook off Kebler Pass. - Swing around the backside (south east side) of Mt. Crested Butte and look down/up the East River Valley. There's a short trail from the TH you can walk easily too. - Drive up towards Gothic, north of the ski area. Lots of awesome overlooks of the East River and up towards Aspen. - If Snodgrass is open (it's on private property, so it usually closes in Aug/Sept), do this hike. It's a little steep at the beginning, but is worth it. - Paradise Divide- rough drive, but you can get good sunset shots from the parking lot. - Yule Pass- easy 4 mile r/t hike with great views from the same area as Paradise Divide. - Drive up and explore around Gothic, a small town a few miles up from Mt. CB. - Dark Canyon Trail is still amazing, regardless of the season. - The Lower Loop is a great option right next to town, good views of the Slate River and Mt. CB. I'm happy to help out with some more suggestions if you have specific questions... I go to CB at least 2-3 times a year. Search my website's Trip Reports section- there are a handful from the last two years from Crested Butte. IMO, it's the best mountain town in Colorado, you'll love it! Agree with Angolan. Make your way up to Elko lake by way of Gothic especially in late Sept.
Canon 5DII w/RRS L plate (x2), Canon 7D w/Kirk L plate, Canon 6D w/RRS L plate, Canon 50D w/Markin L plate, Zeiss 21 ZE, Zeiss 35/2, Canon 16-35 f4L, Canon 24-70 II, Canon 24-105L, Canon 400L f5.6, Sigma 150-600 Sport, Canon 70-200 f2.8 mkII, Canon 50 f1.4, Canon 28 IS, Canon 100L, Canon 85 f1.8, 580 EXII, 430 EX, Rokinon 14mm 2.8, Markin M10, Gitzo 3541LS, Manfrotto 055XPROB - toys, got to love em. Thank you for the great advice on Fall travel to Colorado. I was also thinking of heading to Gunnison Montrose and the Durango areas in late September or early October. Does anyone have an update on the status of fall colors in these areas? I was concerned that the dry conditions might make for an early peak. Any advice would be greatly appreciated. Thanks! I don't know if that sort of thing is clear until the leaves actually start to change. They are usually pretty darn good every year though. Thanks Patrick! I looks like I need to stay flexible. I'm semi-retired so I could probably head west with a week's notice. Can you recommend a good website to monitor the progress of the aspen color change? The website below will have a thread on the colors. You have to be a member to post, but you can read it without joining. The leaves change here pretty consistently during the last week of September to the first few days of October. They won't change everywhere at the same time, but somewhere in that period something will be turning somewhere in the state. I'm aiming for a few days up there around Sept. 25-30. I was in Aspen this past weekend and noticed very small patches of aspens changing- but for the most part, nothing is happening yet. Close to 12k feet there were a few small groups that had completely changed over to yellow, but I'd say 98% of the aspens are still completely green. It has actually been a very wet summer for the Colorado high country, so things should be pretty much on schedule this fall. This week we're getting lots of moisture and temps are starting to dip close to freezing, which should help the colors come along.... my guess is that the last week of September or the first week of October is still ideal, which is usually the case. Follow the Nature Photographers thread that Patrick posted- IMO, that's the best resource out there. It'll contain updates and other good links on where to find the latest and greatest. Thank you for the information. 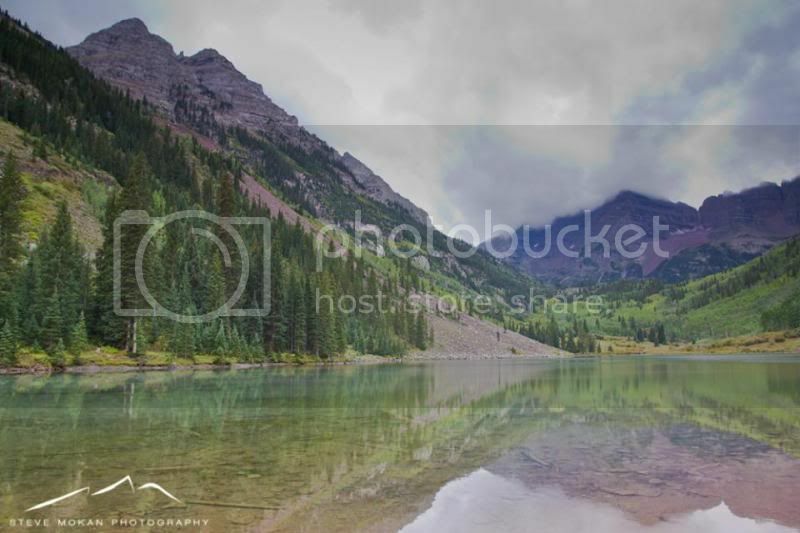 Your image of Maroon Bells is beautiful. I'm still debating whether I'll be able to make the trip this year. I have a window of opportunity toward the end of the month. I'll monitor Nature Photographer's website for updates and hopefully thing will work out oaky. If you can swing it, go. Crested Butte and everything around it is absolutely beautiful this time of year, you won't be sorry. My wife and I were there a month ago but I've already made plans to go again for four days at the end of the month. You'll never see anything like it, I promise. Thanks Steve! I would love to make the trip. Thanks again!